Auto Defect Attorney in Houston - The Gerardo Cantu Law Firm, P.C. Not all car accidents are the result of another driver’s negligence. Sometimes, they are caused by defects in the way the car or truck was made. When the vehicle is to blame for the accident, automobile manufacturers can be held accountable. We will see to it that they are held accountable. With 12 years of experience on our side, our lawyers know how to seek compensation for lost wages, pain and suffering, the cost of medical care, and more. You pay nothing unless we win your case. At the personal injury law firm of The Gerardo Cantu Law Firm, P.C. in Houston, Texas, we handle all auto defect cases on a contingency basis. In some situations, it is clear from the start that some sort of defect caused an auto accident. However, there are also situations in which this is only revealed after careful investigation of the case. Different factors may work together to cause an accident. Even though an accident may have been initiated by the negligence of another driver, it may have been made worse by an auto defect in the victim’s vehicle. Our Houston auto defect attorneys know how to investigate and find out if injuries were caused by a defect in the vehicle. We know how to dig deep to find out what really caused an accident. We know how to gather the necessary information to build a strong case that gets results. Most vehicle rollovers occur in SUVs or trucks. It is well known that these vehicles have a high center of gravity and other design defects that make them more likely than other vehicles to rollover during a crash. These accidents cause serious injuries and even death. Despite the high likelihood of a rollover accident, manufacturers have failed to design adequate safety measures into the vehicles. In many rollover accidents, the occupants are thrown from the vehicle due to defective seat belts, and roofs cave in due to a lack of support, further increasing the likelihood of catastrophic injury or death. Manufacturers are aware of these defects but choose not to correct them, choosing profits over safety. More than 10,000 people are killed in rollover accidents each year. Don’t wait, contact an auto defect attorney, Houston, at The Gerardo Cantu Law Firm, P.C. for a free evaluation of your case. Let our attorney begin working on your SUV rollover accident case immediately. While most drivers will log thousands of miles without so much as an air leak, tire defects can and do occur regularly. The sudden failure of a tire can cause a vehicle to lose control and either roll over or collide with other vehicles or objects. Tire tread separation is in the news a lot these days because of the Firestone tire recall in recent years. Tread separation, however, is not a new problem. Most tires are steel belted radial tires, and tread separation is the most common type of failure in the steel belted radial tire. When the tread separates from the tire carcass or the inner plies, it can cause a blowout. Tread separation can frequently be traced to poor bonding or adhesion of the tire components during the manufacturing process. 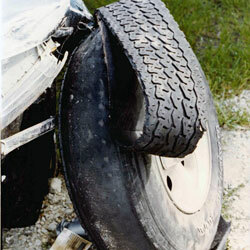 Tread separation can cause the driver to lose control of the vehicles. Loss of control is especially likely in vehicles with a high center of gravity like SUVs and trucks. Read more about tire defects. If you or a family member have been injured due to a defective tire, call the office of The Gerardo Cantu Law Firm, P.C. to speak with an auto defect attorney, Houston. We offer free case evaluation, so call today. During a collision, the vehicle and the persons riding in the vehicle are subjected to potentially destructive forces. Properly designed and manufactured seat belts should restrain a passenger and prevent ejection and violent movement during a crash. However, many of the seat belts which manufacturers have installed in vehicles were defectively designed and can result in serious injury when the seat belt unlatches or fails during a crash. If you or a family member have been injured due to a suspected seat belt failure, call the automobile defect lawyer at The Gerardo Cantu Law Firm, P.C. for a free case evaluation. Call today to start investigating your case. Each year, thousands of people are injured or killed in rear end accidents. Many of these injuries or deaths are caused by the seat back failing. Seat backs should be protecting the passengers not causing catastrophic injuries or deaths. During a rear end collision, the automobile moves forward while the occupants weight presses against the back of the seat. When a seat back collapses, the front seat passenger can ramp backwards and strike his head against the roof. The seat back can possibly be ejected from the vehicle’s rear window. Seat back failure can not only injure the person in the front seat, but children in the back seats are often injured when the front seat collapses backwards. Injuries from seat back failure include head injuries, spinal cord injuries, and brain injuries. If you or a family member have been injured due to a suspected seat back failure, call the auto defect lawyers at The Gerardo Cantu Law Firm, P.C. for a free case evaluation. Let us investigate your case, today. Improperly designed roofs on vehicles greatly limit or eliminate occupant survival space when the roof caves in during a roll over accident. When the roof of a vehicle is crushed, it can come in contact with the occupant’s head and spine. The crushing of an automobile’s roof can also cause the window area of a vehicle to become larger and result in passengers being ejected from the vehicle. Often times persons who are ejected have fatal injuries. Even belted passengers can suffer injuries due to partial ejection from the vehicle when the roof crushes in. More than 7,000 people a year are severely injured or killed as a result of a roof crush. Manufacturers know this but still refuse to redesign their vehicles’ roofs. If you or a family member have been injured due to a roof crush, call the automobile defect attorneys at The Gerardo Cantu Law Firm, P.C. for a free case evaluation. Call today to let us investigate your case. Airbags are designed to reduce or eliminate injuries in front end and side impact collisions. In most accidents, the airbags perform fine, and injuries are reduced. However, defective airbags, such as improperly installed or designed airbags can cause serious and permanent personal injuries that have lifelong effects. It is especially dangerous for small children when the airbags are not designed properly or set for the child’s size. Often times the sensors built into the vehicles fail to work properly causing the airbags to delay deployment or not work at all. If you or a family member have been injured due to a defective airbag, call the auto defect attorney at The Gerardo Cantu Law Firm, P.C. for a free case evaluation. Remember, the time to investigate your case is now. Call today. Many automobiles and trucks are on our roads with defective door latches which release when there is an accident. Often times, children and adults are ejected from cars and trucks when the latch fails, and the door opens. These type of cases, more often than not, result in very serious personal injuries or death. If you or a family member have been injured because of a defective door latch, call the attorney at The Gerardo Cantu Law Firm, P.C. for a free case evaluation. We’re your Houston auto & tire defects attorney. Our attorney is experienced in cases involving automobile defects. Let us evaluate your case today. Contact us today for a free consultation by calling us or sending us an e-mail. Get in touch with an attorney today to discuss your auto defect case.